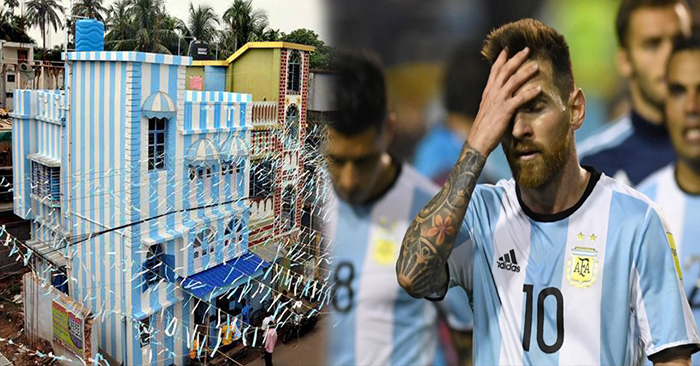 A die-hard Argentina fan in India has painted his house in the team’s blue and white colours ahead of the football World Cup, saying his love for Lionel Messi’s men knows no bounds. Kolkata resident Shib Shankar Patra’s passion for Argentina began during the 1986 World Cup when Diego Maradona helped the team win the coveted trophy. “For me Messi is an extension of Maradona. Everyone in my family loves Messi. We love his behaviour, we love everything about him,” Patra told AFP. Patra who sells tea from a shop on the ground floor of his building wanted to travel to Russia to see his football heroes in person but ran short of money. The family has also made elaborate plans for Messi’s birthday which will fall during the World Cup on June 24. “We will cut a cake and distribute T-shirts among kids with Messi’s face embossed on them,” said Patra, a father of two. Patra has even decorated the walls of each room in his house with life-size posters of Messi. Despite being the second most populous nation, 1.25-billion-strong India has long struggled in world football and is currently ranked 97 in FIFA’s rankings. But the country goes football crazy during the World Cup, particularly in the eastern metropolis of Kolkata, and the English Premiership is a major driver behind the growth of satellite TV. “I will be praying everyday for Argentina’s success. Nothing gives me more happiness than seeing them win on the field,” said Patra.